This entry was posted on Sunday, December 21st, 2014 at 10:09 am	and is filed under Background Stories, Christmas Cards, What's New. You can follow any responses to this entry through the RSS 2.0 feed. You can leave a response, or trackback from your own site. 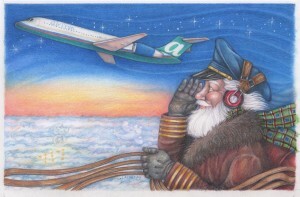 It has Been delightful and extremely interesting to follow the history of AirTran through your drawings and blog. I am honored to callA couple of these pilots my corners and know that Southwest Airlines is gaining the “best of the best!”Thabk you for sharing your talent!